I absolutely loathe the new GW Empire Demigryph Cavalry. I loathe the concept, I loathe the fluff and I loathe the models. The thought of knights riding the cross between an ostrich and a goat is just so full of fail. But like everybody who has read the Empire book I can see Monstrous Cavalry being a solid addition - especially for an all mounted Empire army I'm keen to try. So I’m going to make my own Demigryph Cavalry. 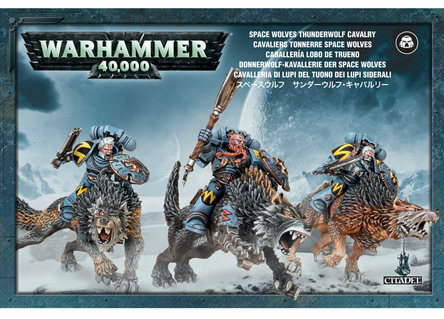 However rather than the chicken-riding knights mine will be Knights of the White Wolf mounted on large slavering wolves. I have just ordered four Space Wolf Thunderwolves and will use those as the mounts. To me it makes more sense than men riding chickens into battle. I’m unsure as to the riders yet. I have some current Empire Knight models and will see whether using the White Wolf sprue I can make suitable riders. If that doesn’t work I’ll look at sourcing demigryph riders from a bits supplier. Wolves are ordered so expect to see some conversions up in the next few weeks. My plans are similar (I already have some wolves, and more are doggy-paddling across the Pacific as we speak), however you may run into the same question I have. White Wolf knights should really have great weapons (or halberds in this case), but the sensible option is lances and shields. Have you worked out what you're going to do there? Really, giant chickens? Whats not to like. Seams to be a common theme on the interwebs, especially amungst the veteran gamers. The hate for the Chochobo riders is amusing. My favourite complaint was on one of the podcasts where they claim they prefer their Empire top be "fantasy free"...but are more than happy to include a pegasus rider in their lists. I personally dont mind them that much. They assembled nicely (except for having to put the tongue in...). I call mine Battle Budgies. Also I'm thinking that 3 with a champ (lances) is a nice cheap set up. Put out enough punch to be annoying, cheap enough to throw away if need be + the champ is choppy enough to grab that bonus 25VPs for killing a hero in a challenge. lol @ Battle Budgies. Like it. And demigryphs are awesome! Chocobos... are semi-demigryphs, and therefore only half as awesome. They look good. I think the riders need to be more dynamic to suit the wolves poses however as they look a bit to static as is. Leaning forward like the Orc Boar boys would help. And show me the cavalry hammer!